Sharing this story with Healing Ink was the first time he shared his story with his 14 year old son. EyalI was wounded twice during an operational service in Lebanon. For the first time in the explosion of a car bomb in Bint Jbeil. Terrorists had loaded a car with explosives and drove it into there car. Eyal's life was saved because the terrorist's car had mechanical issues and exploded before getting to the ramming point. The bombs still had enough power to throw him 20 meters in the air. The second time from a side charge that was detonated on a convoy of vehicles on the way to Bint Jbeil when he and his troop were attacked by guns and grenades. He was injured but there were others in worse condition so he stayed to help, refusing to be evacuated. Today, he has chronic back and nerve pain. Eyal was tattooed October 28, 2018 by artist Arad at Tel Aviv City Hall. The furst bombing i was present and injured in was in ‘97 where there were 3 suicide bombers in concession in downtown Jerusalem, i wasn't badly injured in that bombing, sustained a concussion after being blown to the wall by the blast and bruises and some shrapnal in my legs. A year later, i was in tge market in Jerusalem when 2 suicide bombers blew themselves up, i was in the market hut luckily inside a store and wasn't injured, but was there for the whole hellish scene all over again. The third bombing i was in was also in downtown jerusalem in 2001, i went out on a saturday night when 2 suicide bombers blew themselves up and i was right up the street. Upon hearing and seeing the blasts i knew it was a bombing and told my friends who were with me to leave the area and go home. My friend who was with me at the time was a medic in the army at the time and told me to wait by his car while he assists, i was standing outside by his car and the car to my left had a bomb in it. I suffered shrapnal wounds to my face and neck. Luckily i was wearing a thick leather jacket and it evidently absorbed the shrapnal that would have otherwise penetrated my chest and abdominal area. I thought i was fine for years until crippling depression finally creeped up on me and completly consumed me. Only in the past year or so ive started feeling better and a sense of life has returned to me. I truly never thought that id live to see a day where id like to live to see another day. 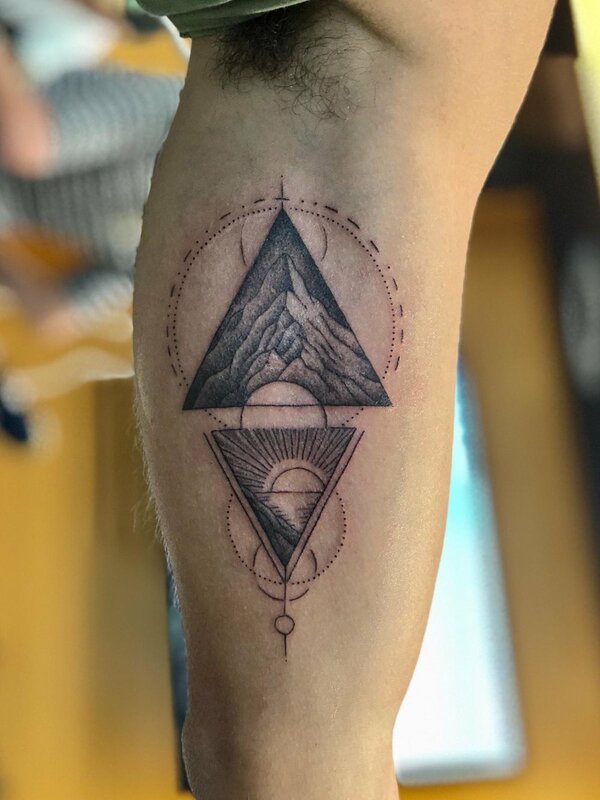 Avigayil was tattooed October 28, 2018 by artist Edit Ben Gida at Tel Aviv City Hall. During the last war, in Gaza for only a week, he went to clear an area with known terrorists. They went to enter a house and it was boobytrapped. The first 4 soldiers died instantly and Bar and others were ripped with shrapnel. Because he could still walk on one leg, Bar started performing medical procedures and trying to evacuate the more injured soldiers until help arrived. Bar was tattooed October 28, 2019 by artist Ryan Ashley Malarkey at Tel Aviv City Hall. To understand Ran's story, you need to understand Israel's history in Lebanon. After many wars, Israel maintained defensive positions in Lebanon to be an early warning and first line of defense against Hezbollah attacks. At some point, Israel tried to remove itself from Lebanon completely but they did so in small amounts, leaving soldiers there with less protection than usual in the process. Ran was one of the last units to be removed. It was his third time going to Lebanon and the first time he did not tell his mom. He told his father but, for some reason, had him swear to keep it a secret. He and his partner had a routine they normally did. This time, they did it differently. That saved his life. He heard a whistle and then experienced complete darkness. He woke up realizing that he was no longer in his tank. A mortar shell had landed 5 meters away. Had they done their usual routine, they would have been right there. Ran couldn't move his legs but felt no pain. He picked his head up and saw lots of blood coming from his stomach and thought to himself "ok, I won't look down there anymore." His Commanding Officer, Omri, was first on the scene and saved his life. Ran's son is now named Omri. He was operated on for 14 hours and the doctors found many miracles: a piece of shrapnel that stopped in the back of his ear, an inch or less from his brain, another piece of shrapnel that pierced his stomach, inches from his spine and one through his groin that severed an artery but, due to the heat of the burning steel, cauterized the wound and kept him from bleeding out. He went through 6 months living in the hospital and another 6 months back and forth everyday with physical and emotional therapy. He felt so thankful to the psychiatrists that treated him that he studied and is now a psychologist helping others. Ran was tattooed on October 28, 2018 by artist Alessandro Capozzi at Tel Aviv City Hall. Rafael cannot fully share his story with us as it was a classified mission that is still unknown. All he can share is that it regards a serious, existential credible threat from within Lebanon. Under cover of darkness, Rafael, a member of the K9 unit, his dog and team had completed their mission and were on their way home when they were ambushed. A bomb exploded next to him and his dog took a majority of the blast. They were thrown in the air and his dog died on top of him. They were trapped under fire for a long time before being rescued. He sustained severe injuries with shrapnel in his body that required 6 months in the hospital in intentensive care and a year after back and forth to the hospital every day for treatement and therapy. Rafael was prescribed heavy pain killers and eventually became addicted. He spent a year in rehab getting off of them. He now has metal throughout his leg from knee to foot, two machines that help him walk and a dropped foot. Even with these injuries, he climbed Mt. Kiliminjaro. Having made it through rehab, he began working at programs for high-risk kids and is in school to become a social worker. 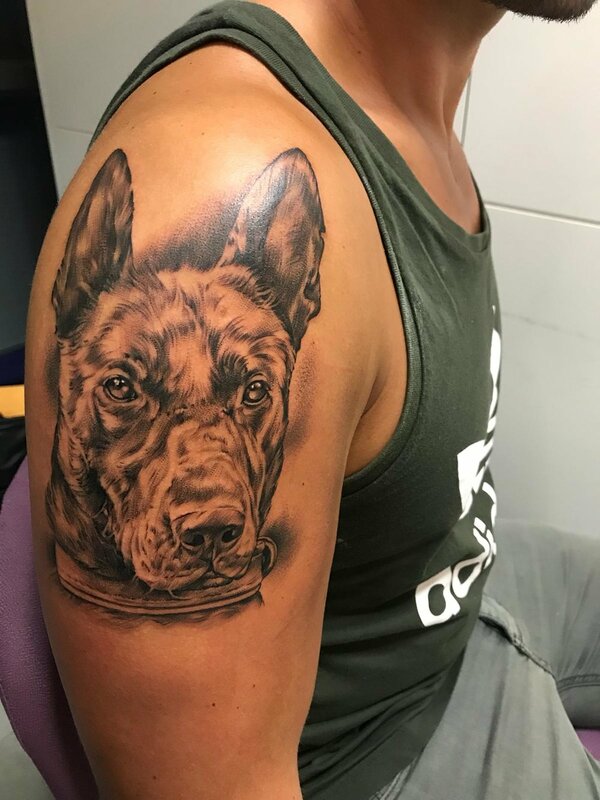 Rafael was tattooed October 25, 2018 by artist Miguel Ochoa at Tel Aviv City Hall.